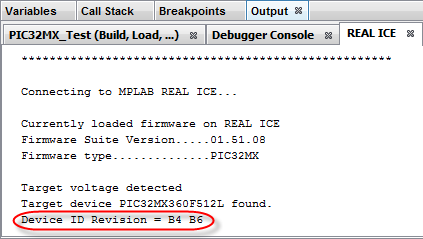 Important conceptual differences between MPLAB® X IDE and Atmel Studio are highlighted below. Some differences are because of the different devices (e.g., PIC® MCUs vs AVR® MCUs) that each IDE supports. Make all the files in the project and add a debug executive to the build image. Remove previous build files and make all the files in the project. Add a debug executive to the built image. Developers may set compiler optimization to lower level when debugging, but Make/Build is the same. Studio 7 has no such differentiation since a debug executive is not needed for debugging. Have a default value on RESET. SOFT recovery: Just reset the part if values don't work. Independent of chip reset, default value from factory (available in datasheet). HARD recovery: Fuse settings should be chosen with care. Note: If an external clock source fails while used as CLK_MAIN source, only the WDT can provide a mechanism to switch back via System Reset. Project/Solution Organizes development at a project level. A project can be stand-alone or work with other projects. Organizes development at a solution level. Device ID read automatically by hardware tool. Verifying a kit connection in Studio 7 is often done by reading a device signature. Communication Interface for PIC / AVR MCU ICSP communication between debug tool and target PIC device.